The 10 South American nations enter the first FIFA international window of 2019 with little time to waste, with Copa America looming just a few short months down the road. The 10 South American nations enter the first FIFA international window of the year with little time to waste, as they take bigger, preparatory steps toward this summer’s Copa America. From a managerial perspective, it’s been an intriguing period for CONMEBOL teams since last year’s World Cup, as many new faces have been introduced in order to either build a new identity or revitalize an otherwise spiritless squad. A quick recap on where things stand: After failing to qualify for Russia 2018, Chile, Ecuador and Bolivia introduced new managers, while Venezuela continues its project under the talented Rafael Dudamel. Last year, Juan Carlos Osorio left Mexico for Paraguay, but he shocked La Albirroja last month as he abruptly exited his post over what he described as family reasons. Eduardo Berizzo has taken over in his place. Brazil, Uruguay and Peru, meanwhile, resume their long-term plans with Tite, Oscar Tabarez and Ricardo Gareca still in place, respectively. Argentina, after bowing out in the World Cup’s round of 16 to eventual-champion France, is now relying on Lionel Scaloni who, in turn, is grateful another Lionel–Messi–has come back to the national team. Colombia, meanwhile, said goodbye to Jose Pekerman and recruited Carlos Queiroz, fresh from an eight-year tenure with Iran. The manager changes are another wrinkle in a window that is ultimately about the players and how their performances during these friendlies indicate how much work remains for them to be where they need by the time June comes around. The Copa America host has a strong squad for these friendlies, even without the injured Neymar and Vinicius Junior, and it looks to continue its six-match winning streak–during which it hasn't conceded a goal–since losing to Belgium in the World Cup quarterfinal. Ajax forward David Neres was called up by Tite to replace Vinicius in the squad and join an attack spearheaded by Roberto Firmino and Gabriel Jesus, while AC Milan’s Lucas Paqueta and West Ham’s Felipe Anderson also come in. Playing without Neymar will be a good test for the Seleção, as Tite will surely tinker with his offensive trio, but it’s at the back where we’ll see some major auditions. Watch out for defender Eder Militão, who is on his way to Real Madrid this summer after impressing with Porto. The 21-year-old made his debut last year against El Salvador in a 5-0 win and his versatility as a center back or right back is a valuable asset. Once again, Uruguay heads to China but this time around it’s without its two main stars, Edinson Cavani and Luis Suarez. Despite returning for PSG, Cavani sits this one out as officials have made it clear it’s best to rest the forward and not risk his recovery during a long trip to Asia. Suarez also misses the fixtures after the striker sprained his ankle during Barcelona’s win over Real Betis. This trip is now a great opportunity for players like Girona’s Cristhian Stuani (tied for third in scoring in La Liga with 16 goals) and PSV’s Gaston Pereiro to perform. Uruguay is a favorite to test the likes of Brazil and Argentina and win Copa America, as the nation possesses a balanced mix of experience, youth and talent, all led under the legendary Tabarez. Uruguay's advantage also comes in the form of its abundance of overseas experience, as all of the current squad aside from one–Peñarol right back Giovanni Gonzalez–plays outside of the country. This is a team that gives opponents exactly what they expect and plays to its identity, and these friendlies probably won’t tell you what you don’t already know. But like Brazil, it will be a good test for La Celeste to play without some top stars. The good news is that these are two solid friendlies that will test Argentina, especially away from home. Messi’s return is also music to Scaloni’s ears, but even with the Barcelona star, this squad needs to figure out its shape and identity before June in order to finally deliver a trophy for the first time since 1993. Scaloni’s mentality has always been about creating team cohesion, and the first project is solidifying the midfield. Defensa y Justicia’s Domingo Blanco earns his first call up, and it will be intriguing to see how much playing time the 23-year-old midfielder gets. The same can be said of Racing Club’s Matias Zaracho, a strong No. 8 who has an endless engine. Up front, there’s no place for the Premier League’s top scorer Sergio Aguero, but Scaloni said earlier this month that the snub was more about using this window to see untested players. Atlanta United's Pity Martinez, Inter's Lautaro Martinez and the older Matias Suarez and Dario Benedetto are among that group. The attacking corps is diverse, and Scaloni has brought together a healthy mix of local and internationally based players. 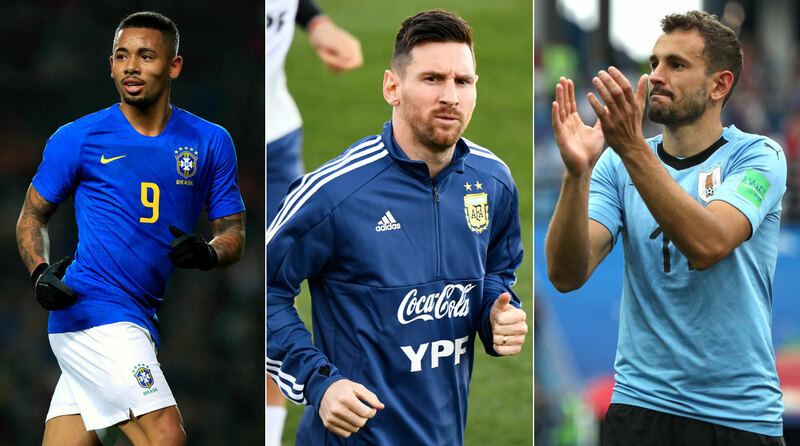 But as emphasized, these friendlies should show Argentina fans that progress is in fact being made, and with Messi returning, all eyes will be on his supporting cast. After a six-year tenure with Pekerman, Queiroz comes in for Los Cafeteros, and matches against strong Asian opponents should be familiar to the manager after his time with Iran. There is somewhat of a mystery around Colombia, as Quieroz only took over the job in February, so these friendlies could be seen as an audition for the players. There aren’t many surprises in his selection, as Radamel Falcao, Luis Muriel and James Rodriguez–fresh off a hat trick for Bayern Munich–all feature. It’s not all good news, however, as Juan Fernando Quintero suffered an ACL tear during River Plate’s win over Independiente on Sunday, and looks set to miss Copa America. Highly regarded, adored by his club and tipped for a huge summer, the talented playmaker was in line to continue his already impressive year with the national team, but news of his injury gives Queiroz an early first test: figuring out how to replace him. After returning to the World Cup for the first time since 1982, Gareca’s side is using these friendlies to further test his squad and build on the big steps that have been taken in the past few years. Peru’s biggest problem at the moment is a lack of firepower, as Paolo Guerrero’s suspension, which came back into effect after Russia, doesn’t end until next month. Raul Ruidiaz is also missing out due to personal reasons, so the responsibility lies with players like Jefferson Farfan and Andre Carrillo. Defensively, Gareca is also limited, as injuries and lack of club playing time has not truly tested some key players throughout the year. This, however, is good news for MLS-based talent such as NYCFC’s center back Alex Callens, who looks to prove his worth during this window. Paraguay embarks on two solid tests for a nation that had to start from scratch again after Osorio departed as manager, but this is a nation with emerging talent, with Newcastle's Miguel Almiron being the main attraction. Players like Atlanta United's Tito Villalba and the New York Red Bulls' Kaku, both Argentine-born attackers, also have a good opportunity to showcase their game. Another one to watch out for is Antonio Sanabria, the 23-year-old striker who is on loan with Serie A’s Genoa from Real Betis and is a classic No. 9 who enters the box at any given opportunity. Berizzo is a Marcelo Bielsa disciple, having played and served as an assistant to the legendary manager, so expect this team to be aggressive at both ends of the pitch. Out of all nations that didn’t make the World Cup, Ecuador is one of the the most appealing, as there is a group of young talent ready to move up the ranks and prove its worth. Among them is 18-year-old Leonardo Campana, who was the top scorer at the 2019 U-20 South American championship, a tournament that Ecuador won. Buenos días! Ecuador U-20 won the South American Championships and qualified for the U-20 World Cup. This goal by Leonardo Campana, the tournament’s top scorer, was...RIDICULOUS. Fresh from taking Panama to its first ever World Cup, new head coach Hernan Dario Gomez has all the tools to revitalize Ecuador. All that remains to sort out is developing consistency. After winning the past two Copa America titles thanks to a golden generation of talent, Chile failed to qualify for the World Cup, and, as a result, the team is going through a major transition. The fear, though, is that the 2019 Copa America has come too soon, as younger, inexperienced players might not be ready to carry the burden of a major tournament. Veteran players like Arturo Vidal, Charles Aranguiz, Gary Medel and Mauricio Isla bring the leadership needed, but up front, without Alexis Sanchez or Eduardo Vargas (Chile’s top and third all-time leading scorers) it will be intriguing to see who leads the front line. Club America's Nicolas Castillo is the most experienced forward on the current squad, with 18 caps. It’s a new era for La Roja, and new manager Reinaldo Rueda has little time to turn them into true contenders. Dudamel’s main objective is to create a strong balance between his experienced players–such as Josef Martinez or Salomon Rondon–and his younger members–such as goalkeeping sensation Wuilker Fariñez (someone who European clubs should be scouting). Playing against Argentina at Atletico Madrid’s Estadio Wanda Metropolitano will give La Vinotinto a solid first test in 2019. Like Colombia, Bolivia is also using this window to face Asian competition but new head coach Eduardo Villegas has already been putting in the work, as his team tied Nicaragua earlier this month. Given the overall lack of international experience and Villegas’s reputation in Bolivian soccer, this team will place a stronger emphasis on local talent. There are young players who could impress, including Ramiro Vaca, the 19-year-old attacking midfielder from The Strongest. These two next matches, however, are key to see just how much Bolivia has to climb in order to get out of a Copa America group that includes Brazil, Peru and Venezuela.